Known for its near-idyllic climate (77ºF high and 65ºF low), 70 miles of pristine beaches and dazzling array of world-class attractions, San Diego offers a wide variety of things to see and do, appealing to guests from around the world. 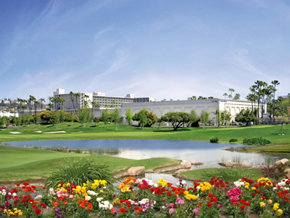 HPLC 2020 will be held in the Town and Country San Diego located on 32 lushly-landscaped acres in Mission Valley and only 10 to 15 minutes from San Diego International Airport. The Town and Country is a modern hotel and conference center located near dining, entertainment, shopping, beaches, and exciting attractions such as the wsorld-famous San Diego Zoo in iconic Balboa Park, SeaWorld Adventure Park, LEGOLAND, Old Town San Diego, the Gaslamp Quarters, Mission Bay, and Seaport Village. For more information about San Diego, please visit www.sandiego.org. We welcome you to HPLC 2020 on June 20-25, 2020 in the Town and Country hotel in San Diego, CA, USA. We encourage you to make your hotel reservation as early as possible, and well in advance, as there is a limited number of rooms available at the discounted conference rate during this busy time of year. The discounted room rate will be available until May 22, 2020, or until the rooms or rates are sold out. Please be aware of scam hotel booking operations that may call you directly to offer discounted room rates. We encourage booking your room only through the hotel link provided by the conference. Reservations must be guaranteed with a major credit card. Cancellations at least 48 hours prior to arrival to avoid cancellation fees. It has come to our attention that scammers are targeting a variety of conferences and attempting to contact attendees to solicit bookings at a variety of hotels. Should you receive one of these emails or telephone calls, please know that HPLC 2020 does not rent or sell email lists to third parties, and our host hotel will never send emails or place telephone calls to individuals in order to promote specific accommodations. Entering financial agreements with non-endorsed companies could result in financial charges with no guarantee of a room when you arrive in San Diego. Please do not provide any personal information to any companies other than HPLC 2020-San Diego regarding your housing in San Diego, as these companies may be "pirates". Valid emails come from @barrconferences.com. No emails are sent via Gmail/Yahoo/Hotmail, or other such accounts.